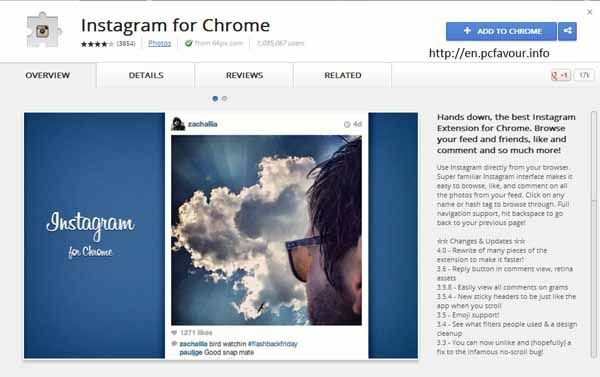 Instagram for Chrome is an add-on for Chrome Web Browser which allows you to manage and interact your Instagram feeds directly from Google Chrome. Users can interact and view their Instagram photos from their mobile phones too. Instagram is a website, which allows you to share your photos online as well as provides social networking service. It allows you to take images and pictures and apply digit filters to them. You can also share them directly to Facebook or Twitter. Use Instagram directly from your browser. Super familiar Instagram interface makes it easy to browse, like, and comment on all the photos from your feed. Click on any name or hash tag to browse through. Full navigation support, hit backspace to go back to your previous page! 4.0 – Rewrite of many pieces of the extension to make it faster! 3.3 – You can now unlike and (hopefully) a fix to the infamous no-scroll bug! 1.8.4 – Zoom button on every photo! 1.7 – Click on followers / following to see a full list. Full list of likes! 1.4 – Load more button, finally! This Instagram for Chrome uses the Instagram(tm) API and is not endorsed or certified by Instagram or Burbn, inc. All Instagram(tm) logoes and trademarks displayed on this chrome extension are property of Burbn, inc.